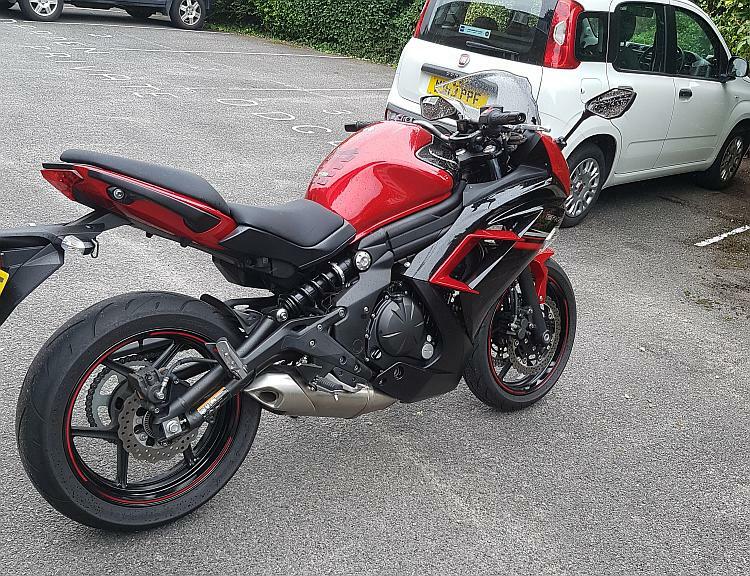 Today I picked up an 18-month old 2015 Kawasaki ER-6f ABS. 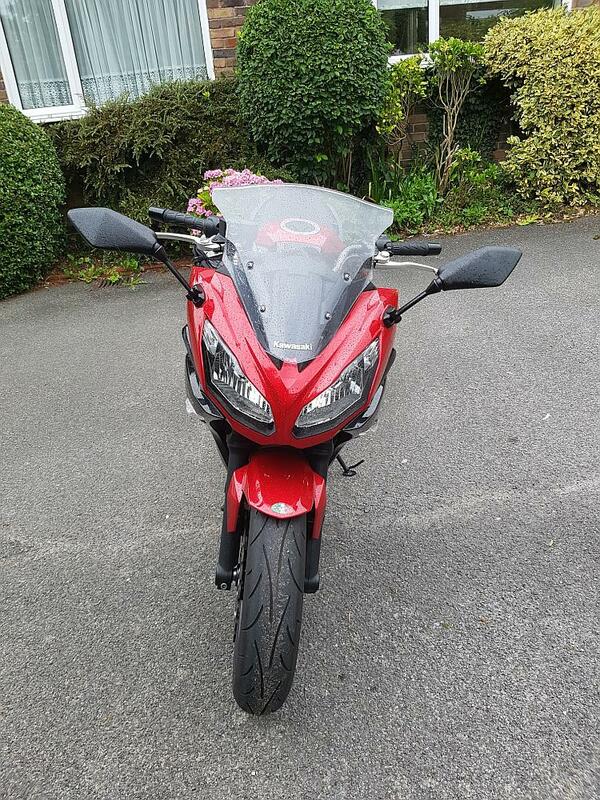 Although I had considered this bike as a 'new bike' purchase when I was working, once I'd retired in December 2015 I thought that once the time came to trade-in my Honda Forza 300 scooter (bought specifically for commuting initially) I would probably go down the 'used bike' route. 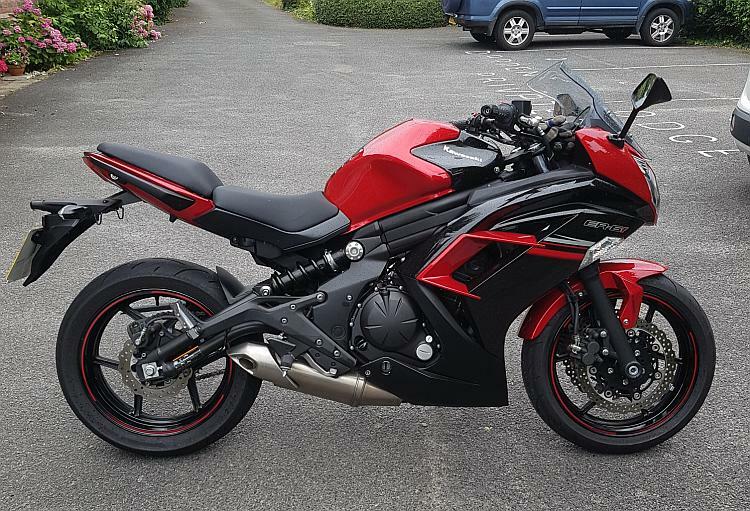 In the last couple of months I'd sort of narrowed my choice down to a Honda VRF800 V-Tec or a Yamaha XJ600 Diversion (although briefly a Honda CBR600F came in for consideration). On the morning of setting off to view two Hondas I chanced upon this Kawasaki at my local dealer by taking a last-minute check for a bargain on Alf's Motorcycles of Worthing's website. 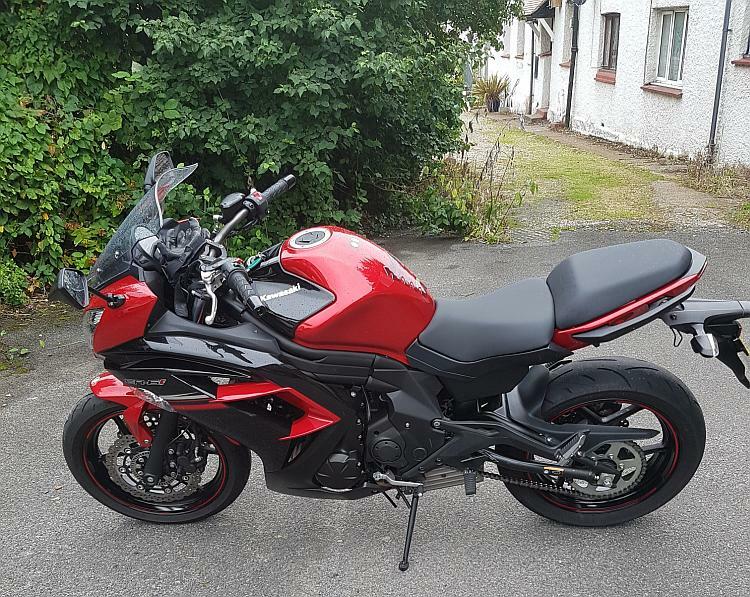 The deal was done and, as the bike had only done 473 miles, it was due it's 1st service which by and large is just getting rid of the thinner running-in oil and replacing it with the real stuff followed by a general check to see nothing has fallen off or worked loose. As the dealer was short of staff I had to wait a week until today to pick it up. It was raining just as it has virtually every time I've taken a new (to me) bike home. Initial signs are very good. I like the riding position - sporty but not MotoGP-replica sporty. My knees appreciate that. It also wasn't too difficult to mount the bike - it's a long time since a rode a motorcycle with an 800mm seat height. I was a bit concerned about it when I took a test-ride last week. So far nothing has shown to be to be a concern although I will miss not having a centre-stand. I've just ordered an Abba bike stand to aid with minor fettling like chain maintenance and cleaning. I just don't think you can do a good job with the bike leaning towards you. A gear indicator would have been nice too. I can buy one for £98.99 but it's unlikely I'll bother. I don't take pillions - never have - so I've ordered a seat cowl too. I travel very light when touring. I can fit four day's-worth of kit into a 30 litre drybag so I have a decision to make as to whether to buy Kreiga US bags (I'll have to save up for these next year) or go down the cheaper route of packing my clothes into my 15-year old Kreiga R35 rucksack and buy a Givi tank bag for carrying washkit, electronics and stuff I need to hand like passports & ferry tickets. I'll add a full review once I've put a few miles under my bike but until then here's a few pictures. I hope to pass my test this year and get my full licence. I'm learning on a er6n which I'm enjoying and the acceleration is surprisingly gentle - no nasty surprises! When I move up to a bigger bike, I hope to travel and at the moment favour the protection of the fairing and windscreen that the er6f offers. They are great looking bikes too and have had good reviews. They will last if looked after and the older models fit my limited budget too. They are fine bikes aren't they. I've put about 150 miles on mine in the first week mainly through giving her short blasts around the lanes of the South Downs. This is a good test for a bike as I feel you can't go full-on around here (unless you are tired of living). There are many hazards to watch out for like farm vehicles and non-attentive drivers that keep you focused. I'm not missing a gear indicator as much as I initially thought I would but I do at times attempt to find an extra gear in top at around 4800rpm (60-65mph) but it's not a major issue and most likely me getting used to the sound and feel of the engine. I've not had to fill her up yet (I have 2 bars on the guage to go) so will work out the mpg after the 2nd refuel by using the Fuelly.com app. The bike is proving comfortable after 45 minutes or so but I will need to test her on a longer run if I'm going to go touring. You can't tell by a dealer test run or hopping down to the shops. I notice you are thinking of going touring once you pass your test. Let me know if there is any advice you might need as I do go across the channel quite a bit now by both ferry and Eurotunnel. I travel light. By for now, let me know how the test goes.